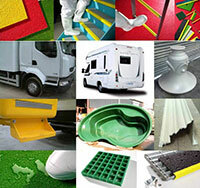 We produce high quality Anti-Slip sheets / products, and Composite mouldings providing a variety of components for a manufacturer of luxury motor homes / caravans and manufacture of aerial lift baskets for powered access vehicle manufacturer, Lining out Vans in GRP for the food industry etc. We also produce small components to truck body sized components in volumes of 1 to 1,000s units per year for Architectural, automotive, marine, construction, leisure, and industrial etc. If you have an application where a glass reinforced plastic component could be of benefit, or are thinking of developing a product in glass reinforced plastic, give us a call we would like to help, with our innovative experience. We are able to reproduce parts from new, as well as able to provide restoration services for existing items. Low volume parts are made by traditional open moulding (hand/spray lay-up GRP) Higher volume parts are made by Vacuum Moulding (VM) or by RTM (Resin Transfer Moulding). Our highly skilled team of laminators / tool makers and trimmers have many years of experience in this industry, which ensures our customers get quality products at all times.